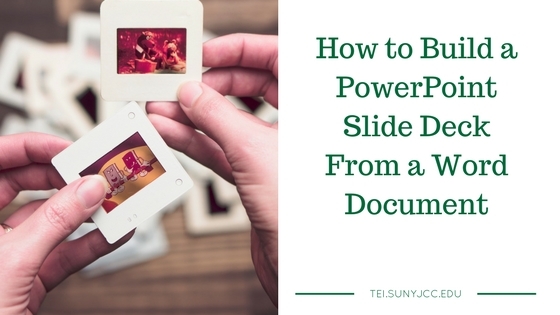 Two weeks ago, I gave a Webinar on Improving your PowerPoint Presentations. In the presentation, I showed my method for taking content from a Beyond Bullet Points template and converting it to a PowerPoint slidedeck. In this post and video, I will outline those procedures. My MS Word CleanPresentation macro – Rename with a .bas extension. Open your Word document. In the example, I open my presentation Word document created with a Beyond Bullet Points template. You could use a simple outline. Select the entire document. CTRL-A will select the entire document. Copy the selection. CTRL-C will copy the document. Create a blank Word document. Paste what is on your clipboard to the new document by Keep Text Only. Using the Paste drop-down menu from the toolbar, select the Keep Text Only option. Clean up the document as you desire or run the CleanPresentation macro. Instructions for adding a macro can be found the How do I print a quiz from Blackboard 9.1 post. You would have to substitute in the CleanPresentation macro. Save your Word document with one item on each line. Open PowerPoint, and start a new document with your Beyond Bullet Points template. From the New Slide drop-down menu, select the Slides from Outline… option. Note: It is towards the bottom of the list. Find your newly created Word file. Apply a layout to your slides and add notes and images as appropriate. ← How Do I Print a Quiz From Blackboard 9.1?